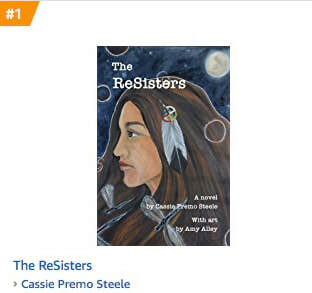 The ReSisters hit #1 on Amazon in the second week after publication. "I read The ReSisters in one fascinated sitting, completely drawn into the story of a dystopian future already present in too many ways. Steele writes with a confident energy that is captivating—I could not put down the novel until I learned the fate of Sanna, an indigenous teenage girl whose life has been blown apart. She won my heart." "Cassie Premo Steele has written a stunner of a novel, one that speaks profoundly to (and of) our times, yet also carries a timeless wisdom—a wisdom that knows the power of art, the power of story, the power of love, yet also knows sometimes there are no easy answers. The ReSisters left me breathless and shaken and grateful." "The ReSisters offers a striking portrayal of a world that is both alarmingly possible and already here--a vision of a United States in which patriotism, nationalism, and xenophobia are valued above all else, and in which those who resist are targeted, detained, and endangered. At the same time, Steele offers us a glimmer of hope, revealing the many ways in which resistance can take root, heal, and grow. A chilling, moving, and all-too-possible story."